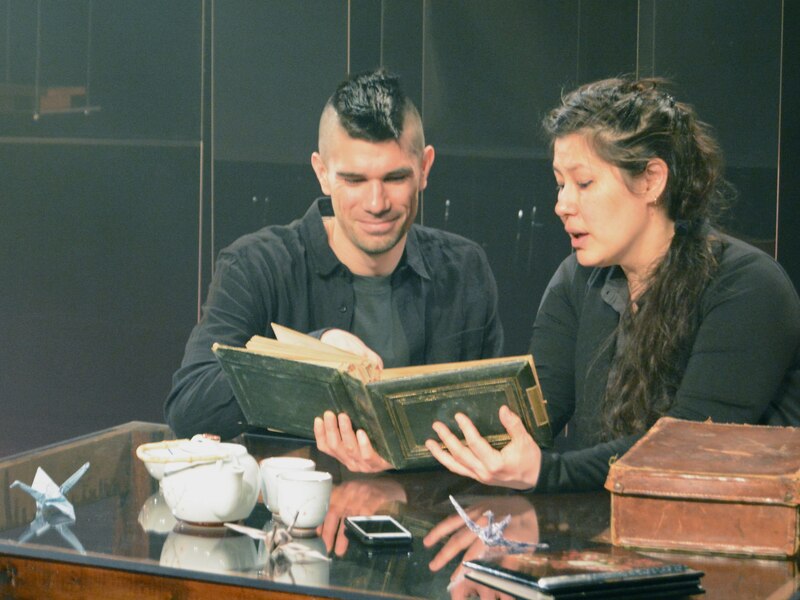 Matt Miwa (left)and Julie Tamiko Manning (right) leave no chapter unread in The Tashme Project on stage until February 10, 2019. While some souls of injustice find it hard to remember, others can never forget in this thoughtful play that underscores the true meaning of survival. The purpose of any project is to achieve a specific outcome determined in a meticulous planning stage. If the objective of CrossCurrents’s verbatim theatre creation was to wrap a collection of memories with a shiny bow then mission accomplished. It’s hard to imagine this 80 minute two-hander being much better than it is. Playgoers are drawn into the atmospheric dreaminess of the show from the start and slowly migrated to places of joy, sadness and indifference to ethnic relocation, segregation, discrimination and reparation. This is, after all, 20 portraits of Japanese Canadian descendants displaced by the Canadian Government’s internment camps in the early 1940′s while our American neighbours were immersed in a brutal war with The Land of The Rising Sun. It’s impossible to resist this presentation of bountiful beauty that stirs up a wealth of recollections from the people that were confined to enclosed spaces for the supposed sake of national security. The genuine connection that Julie Tamiko Manning and Matt Miwa have with the story assignment results in a colourful and, at times, intriguing characters give The Tashme Project immense heart and soul in their delicate handling of the source material. These are actors that weave in and out of different personas with the greatest of ease illustrating their broad range as talented performers. Through an assortment of authority issued correspondence transformed into oragamis, the audience get a profound sense of worlds turned upside down through no fault of their own. An intrepid lighting and videography design adds to this culturally enriching looking glass into the past.